Sixteen University of Texas Rio Grande Valley students completed a study abroad trip to South Korea. From learning to cook traditional Korean dishes to practicing Taekwondo, UTRGV students spent two weeks studying the language and traditions of a culture previously unfamiliar to them. From learning to cook traditional Korean dishes to practicing Taekwondo, University of Texas Rio Grande Valley students who studied abroad in South Korea this summer got the experience of a lifetime wrapped into a two-week course. South Korea proved to be a trip that changed the course of future plans for more than 16 students, all from the Rio Grande Valley, said Mijin Oh-Villarreal, a lecturer in the UTRGV Department of Writing and Language Studies. Oh-Villarreal organized the study abroad trip, which offered a Beginning Korean Studies II mini-semester course. A native Korean, Oh-Villarreal said it was rewarding to know her students opened their eyes to accept a world so different from their own. “It was exciting to see and hear my students reflect on their cultural experiences every day. My students and I loved Korea,” she said. The course was taught in cities like Seoul, Yongin, Suwon, Jinju, and several other places where students were able to use what they had learned in Beginning Korean Studies I and apply it in a fun and immersive environment, she said. Aylin Reyes, from Brownsville, is a Spanish major with a teacher certification. She said traveling abroad helped her gain a new language and amazing friendships with South Korean students. “I gained a new confidence, and I know now that I am able to travel abroad without any trouble. It motivates me to keep wanting to travel the world,” she said. One of the best moments of the trip for Reyes was hiking up a mountain to get a birds-eye view of the city, which she described as breathtaking. She said the most challenging part of the trip was breaking the language barrier. “Once we were confident enough with our hangeul (Korean language), we had conversations with people and felt so accomplished and fulfilled,” Reyes said. Oh-Villarreal said she wanted her students to acquire a variety of expressions to use in any given situation, and to build confidence in their listening and speaking skills. Students worked in pairs or with language buddies to motivate one another to practice speaking and listening in authentic, natural settings. “Reading and speaking useful phrases in Korean with native speakers provides more memorable experiences required for true learning,” Oh-Villarreal said. Ana Lopez, a theatre design major from Brownsville, said South Korea was amazing in all it had to offer, from cultural experiences that included wearing a hanbok (traditional Korean dress), making rice cakes, preparing and drinking tea properly, and chowing down on Korean cuisine. “I got to eat so many different foods, both that I knew about and those that I had no idea what they were. I left South Korea eating some vegetables, which was shocking to me because I don’t like vegetables,” Lopez said. Scarlett Basurto, an anthropology major from Alamo, said this trip was her first time studying abroad. Each day commenced by 7 a.m. with a jam-packed itinerary that included traveling by subway or bus to get to their destinations, she said. 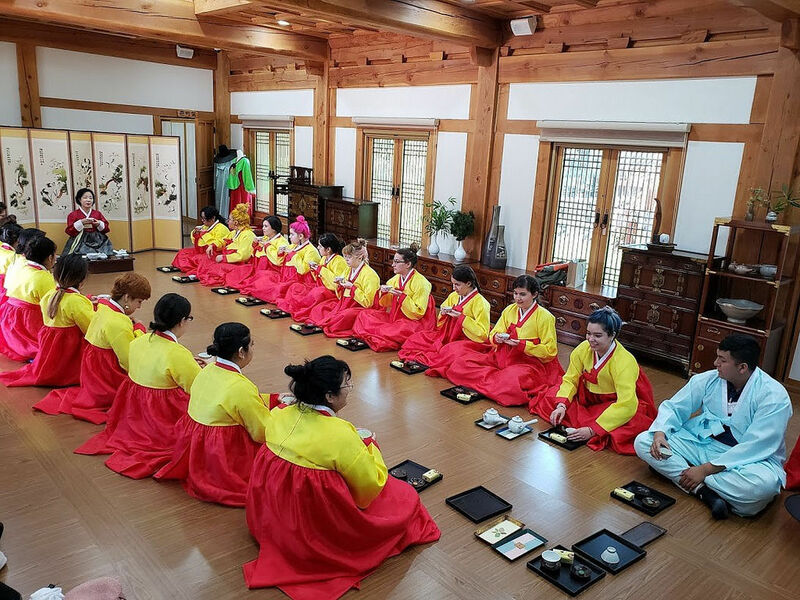 They visited a university, a community school, palaces, a Korean folk village, markets, and events and performances that highlighted Korean traditions, such as a wedding ceremony, traditional music, tightrope walking and horse-riding tricks. “Words can’t describe how magnificent and iridescent the experience was. I truly fell in love with South Korea,” Basurto said. She said the most interesting things about South Korea are how they value the elderly, and how friendly they are to visitors. “I greatly appreciated their willingness to help strangers,” Basurto said. Oh-Villarreal encourages UTRGV students to take the plunge and study abroad, as it will not only be an eye-opening experience, but also has the potential to change their lives. >> Ana Cristal Munoz Arambula, international business major, Mission. >> Ana G. López, theater design major, Brownsville. >> Ashley M. Gonzalez, international business major, Mission. >> Aylin Victoria Reyes, Spanish with teacher’s certification major, Brownsville. >> Benino Chapa, electrical engineering major, Edinburg. >> Carmen Juliana Hernandez, interdisciplinary studies major, Brownsville. >> Carolina Moreno, biology major, Mission. >> Elvia Munoz Arambula, international business major, Mission. >> Evelyn Lomas, English, Mission. >> Kassandra Rodriguez, theater design, Mission. >> Kathryn Garcia, nursing, Edcouch. >> Kristelle Gonzalez, biology, McAllen. >> Maricruz Flores, electrical engineering, Edinburg. >> Myrine Barreiro-Arevalo, biology pre-med, McAllen. >> Scarlett I. Basurto, Anthropology, Alamo.